While people new to the Nintendo DS system might not be familiar with its official wireless symbol, it's pretty self-explanatory and clearly marks the option (there are no labels unless a menu item is highlighted). The opening credits aren't overly long (and can be partially skipped). The download time is quick compared to other game downloads. The menu system has no labels until you select (highlight) an option, but then the label is large and easy to read. Tapable areas are accurate. The control scheme in Professional Fisherman's Tour: Northern Hemisphere (PFT:NH) is extremely difficult to learn (see below). Once learned, the game becomes extremely repetitive, not counting a player's patience while they attempt to locate fish in the first place. Generally, game publishers seek games that are easy to learn to hard to master: this game is the exact opposite. While the game is programmed to look murky, the murkiness can get in the way of players having fun. The sound is unnecessary if you're watching the screen. Two options are present (the win condition and the time limit). Rumble Pack functionality downloads along with the game. PFT:NH is a very difficult game to learn. The included instruction book is terrible and is missing chunks of information. It took me nearly forty (40) miunutes to catch my first fish so that I could understand how it was done. The game's also got a problem with realism: just like real fishing often involves long wait times, so too can this game. 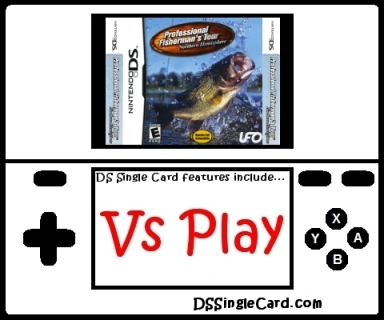 While experienced fishers may not have a problem with this, casual gamers trying out the title most certainly will. I recommend an "Easy" mode where there are tons of fish, so that it's easier to learn and more interesting to new/trial players. Add in an "Easy" mode with lots and lots of fish. Hire someone to write quality directions in the included instruction book (or have the programmers do it). Allow players to decide whether the waters start murky or not. Include Co-op Play (while timing the players as they seek a certain fish weight).